Finish off your Skylark with our body side graphic kit! 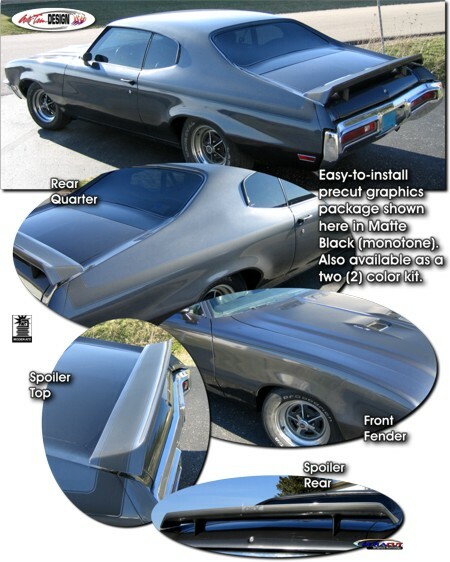 Created for the '70-'72 Buick Skylark, this graphic kit will bring the vehicle back to period. Precut (removal of door handles required) graphics are offered as a monotone or two (2) color kit. It'll make your Skylark look great. Comes with general online installation instructions and care guide. Please Note: This IS NOT simply a stencil set as provided by others. This kit consists of premium automotive grade vinyl materials in the color selection of your choice. Two (2) color kits require assembly at time of installation (i.e., Base Color is installed first, then Highlight Color).